This will go in the standard today 22 Nov. I used to work on the railways in the Seventies and Eighties. I’m now the health and safety officer for Unison in Camden and I travel to work every day on the Piccadilly Line. 26 years on from the King’s Cross fire, the Underground is pushing through a policy that will see 950 fewer station staff across the network and one supervisor having to cover six smaller stations, under the pretext of modernisation. Yesterday’s announcement is the thin end of the wedge to the introduction of driverless trains and further job losses, which we know is on London Underground’s agenda. I simply cannot believe management when they claim that no station will ever be unstaffed – that may not happen in central London but what about over the longer term at outlying stations where there are fewer passengers to check? The Mayor’s arguments that the changes are all “to take the Tube to the next level” are undermined when he is making similar cuts at fire stations, leaving London’s fire cover more thinly spread. I would be prepared to pay the extra pennies in tax and on my Tube fare to maintain staff at current levels just as with the fire service. If the public had the full facts on staffing, I predict they would back the Tube workers on a fundamental issue of health and safety. Meanwhile Unison will do everything it can within the law to offer solidarity to Tube workers when they take industrial action. 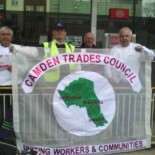 This entry was posted on November 22, 2013 by CAMDEN TRADES COUNCIL.